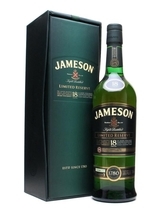 As the master blender's special selection of very old Jameson Irish Whiskey, this bottling represents. Rich honey color, tropical fruit scent with a touch of thick caramel. The flavors are bright and vibrant-lychee, banana, orange peel, tempered by a wash of honey-and the finish is intriguing and dry with nuances of white chocolate, banana, leather and nutmeg. Beautiful.